Well, that doesn't sound very appetizing, does it? But the challenge is! It's Taylor's Dare to Get Dirty Challenge for today and we had to use....cupcakes in our card (of course because Taylor is all about cupcakes)! I pulled out all the cupcake stuff I had (which was surprisingly a lot). I ended up with this design because of the ribbon. That was my inspiration today. I matched up this patterned paper from Basic Grey's Cupcake and the pink pirouette and riding hood red from SU. The big cupcake, from Inkadinkadoo, was colored with copic markers. 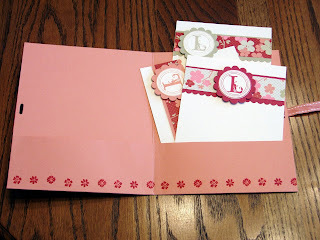 The pink frosting was stamped on scrap, colored and cut out. I didn't put it on dimensionals, but paper pieced it because it gave it more dimension. The jimmies were colored with copics, then I went over them with Spica glitter pens. 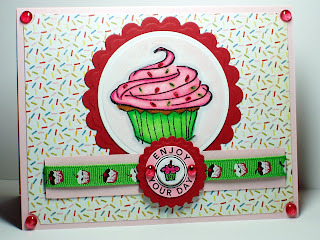 The "Enjoy Your Day" image from Riveting was altered in the middle with the cupcake from Short and Sweet. I just stamped it on scrap, punched it with the 3/4" punch, and put it up on a dimensional. I added dew drops (again!) to that image and in each corner of the card (love them!). I used Julee Tilman's Mojo Monday #46 sketch (I thought it was this week's sketch, but it was from a couple of weeks ago!). 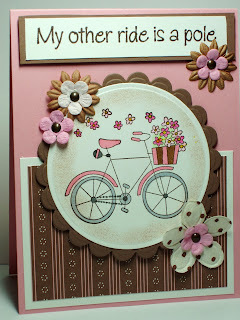 I think this is a cute "girlie" birthday card. I only wish the cucakes on the ribbon were going in the other direction! Oh well, thanks for lookin'! Yes, you can Dare to Get Dirty if you are an SCS Fan Club Member. There is a whole other part of SCS for Fan Club Members that is fabulous! Just another perk for being an SCS member. All this week, the "Dirty Girls" are putting out challenges. Holly, aka Toy (who happens to live about 3 miles from me), put out this sketch challenge. If you are a Fan Club member, you can find it here. I loved this sketch and started this card at 1:00 AM! I was busy all day, and finally got a chance to look at the challenge! Crazy, I know, but when I get my second wind, I could stay up all night (night owl, I guess!). Back to the card. I had to find an image small enough to fit this oval. I was bummed because I thought I had oval Nestabilities, but realized I didn't. Luckily I had the Marvy ovals that worked fine. 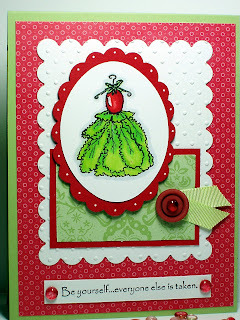 In the end, I chose this Karen Lockhart stamp (it's called Tomato with Greens). I colored it with copic markers. I used a white gel pen to highlight the tomato. I also used Spica glitter pens in silver for the hanger and clear to add some shimmer to the greens. It doesn't show up in the picture, but when the light hits it, it's quite shimmery. I used the white gel pen again to draw some dots in the scallops of the mat for the main image. I used the largest scalloped Nestability I had to cut the white piece and then ran it through the Swiss Dots cuttlebug folder. I needed some sort of embellishment, and went for the new SU buttons. This one is Riding Hood Red. I put a piece of celery grosgrain ribbon I found in my ribbon jar behind the button. I thought the sentiment from Rosie's Roadshow fit with this unusual stamp and put two dew drops on either end. 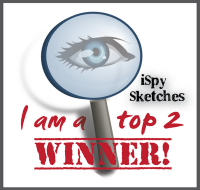 (I thought it was appropriate to use this stamp as I won it at the WNY SCS gathering I went to in April that was co-hosted by Holly! Thanks, Holly!) I finished it off with a dew drop on the button. I'm really pleased with how this turned out (for 1:00 in the morning!). In hindsight, I wish I had added some Crystal Effects to the tomato to give it some shine and dimension. I have two more cards to share, so keep on reading after the recipe. I have a friend who recenty lost her father. A few days before she had to put down her precious dog, Maggie. So I have two more sympathy cards to share. 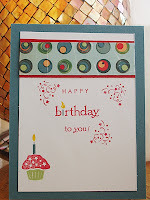 This one was inspired by Julee Tilman's card. I fell in love with it, so much so that I had to purchase these butterflies, called Fluttering By by Verve Visual, Julee's company. I started by pulling out this new dp from SU called Bella Rose and then paired it with Chocolate Chip and the new In Color Riding Hood Red. The butterfly was stamped on the white piece in Chocolate chip, again on a scrap piece of white, then again on the dp. I paper pieced the butterfly, cut it out and mounted it on top of the one stamped on the white piece (I did this because I did not want to cut out the antennae). The sentiment, from PTI's Mailbox Greetings, was also stamped in Chocolate Chip. When I mounted it on the white card, it looked a little bare, so I ran it throught the Textile cb folder, scalloped the bottom with SU's new scallop border punch, and added a strip of chocolate chip and the dp on the bottom. Dew Drops were added to the butterfly's body and anntenae and on the scallops on the bottom. (I've recently found these dew drops and have been using them quite frequently, as you can see). The inside looks like this. I love this sentiment by River City Rubber Works that I got at my LSS many years ago. The little butterfly is from Verve's Petals and Stems. I have another after this recipe so scroll down. This last one is a sympathy card for my friend who recently lost her Dalmatian, hence the black and white. I didn't have a Dalmatian stamp, so I used this one from Whipper Snapper, Sweet Sniffs of Spring, and made him look like a Dalmatian (well, sort of...use your imagination!). The image was colored with Prismacolor pencils. I think I added Crystal Effects to his nose (I don't remember because I sent it out a while ago as soon as I made it). I wanted to make this a black and white card, so I chose this patterned paper from DCWV called All Dressed Up (it's a great pack!). The ribbon (yes, that's ribbon running vertically) is something I picked up in a sale bin at Walmart. I chose to add the red to coordinate with the flower. It needed something else, so I added the paw print. The thing I like best about this card is the sentiment on the inside. I found it used on a card on SCS a while ago and they mention it was from DRS Designs, so I went right on over and got it. I says "Four legged friends are a very special part of any family. Special thoughts are with you now that you've had to say goodbye." Since I'm a dog-lover, as are many of my friends, I had to have it for special cards like this one. Thanks so much for sticking with me on this long post and please stop by again! 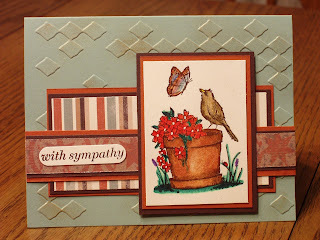 My husband needed a sympathy card for someone at work, so I decided to use today's sketch challenge SC186 and this new SU set called Serene Spring. I used Prismacolor pencils to color this image. I'm just noticing that it is not straight...it's sort of crooked! That really bothers me, but it's late and I'm not redoing it! This was difficult for me to do because I wanted it to be a little more masculine even with the flowers, bird and butterfly. 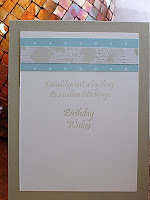 The base of the card is sage shadow and I used the diamond cb folder. I also highlighted the embossed diamonds with some rub on metalic paste to give it some sheen. I wanted to start using up some older dp, so I used Outlaw. I like the image, but I'm really not crazy about the card. It really does look better in person (they always do!). Thanks for stopping by! This is for today's color challenge of soft sky, river rock, and vanilla. I started this card this morning and worked on it intermittenly throughout the day because I had some important things to do today (go to the gym, get hair done, and go to a baseball game!). 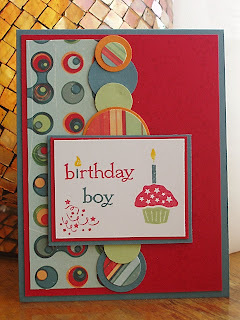 I started by pulling out all the colors and the patterned paper that went with these colors. I loved the way they looked together. I chose to use this stamp from the new SU Dreams du Jour set. I stamped it in river rock, then colored the flowers with a copic marker and colored the leaves with river rock and a blender pen. I then cut it out and mounted it on two circles cut and embossed with Nestabilities. I was only going to use one of the ribbons, but couldn't decide which one so I used both. Why not, right? After it was all done, I didn't like the way the two ribbons intersected in the corner, so I added the flowers and put a crystal brad in the middle to bling it up. The flower centers on the main image needed some bling too, so I used a dab of crystal stickles. I really like the way this turned out. The sentiment is from PTI's Limitless Labels. Here is the inside of the card. 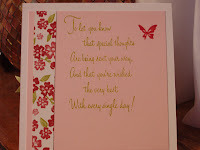 The sentiment on the inside is from Gina K's Friendship Blooms. It says "Friendship isn't a big thing, it's a million little things". I think that's such a beautiful sentiment. I'm giving this to my friend Maria for her birthday tomorrow, but she won't get it until I see her on Friday. I hope she doesn't see it before then! Thanks for stopping by and see you tomorrow! I found out today that one of my favorite aunts, Aunt Vi (I've written about her on my blog before...she loves to send and receive cards), had a stroke this week and she is now in a nursing home for rehab. So I had to immediately make a card for her because we are going to visit her tomorrow afternoon. 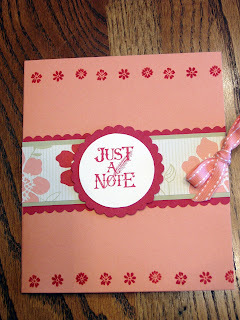 I wanted a bigger card and something very pretty and feminine. This new paper from SU, Bella Rose, is just that. 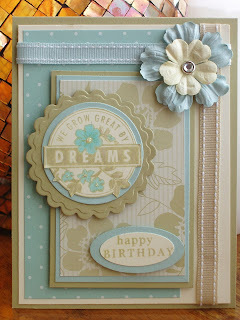 And this flower from Live Your Dream worked well for this sketch by Diane Zechman (papercookies). You can see the sketch here. All the inks I used are the new SU In Colors. I used Kiwi Kiss to ink up the stem and leaves of the flower. Then I used the ink in the lid and a blender pen to get color on the flower (Riding Hood Red and Pink Pirouette). After I stamped it, I went over the flower again with the blender pen to get a darker color. The rest is pretty self-explanatory. The dew drops I've had for about a year and never used. I sort of forgot I had them until they fell off the shelf and hit the floor. I guess they were tired of being ignored! They are a nice accent to this paper. The PTI grosgrain ribbon is Spring Moss and went nicely with the Kiwi Kiss. This card is 5.25" square. Here is the inside. I used Pink Pirouette and a strip of the Bella Rose dp. 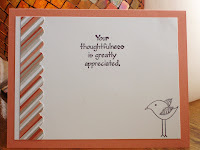 This sentiment stamp is from JoAnn's. 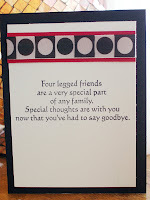 I purchased it a long time ago and it works for Get Well cards, birthday cards, and pretty much any other type of card. The company that makes it is Angel's Attic...never heard of them before. Before I leave, I want to show you what I've done. It may not be an "Aha!" for you, but it is for me. 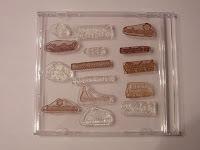 I have several PTI stamp sets, and many of them have a "handstamped by" stamp in them. I'm constantly using them and have to go through all the sets to find the "right one". I had this lightbulb go off the other day to take all those stamps and put them in their OWN CASE! How genius is that? You've probably already done that, right? Well I did that today, and I'll keep that CD case near me so I can finish my card and not have to search each CD case for the right one! Here's a picture of it. It's probably going to be difficult to see, but I wanted to post it anyway. Good idea or what? Let me know if you've already done this or if this is something new to you. I'd like to know if I'm a pioneer in stamp organization! (LOL)! Thanks for stopping by and please take a look at the next card I posted today also. 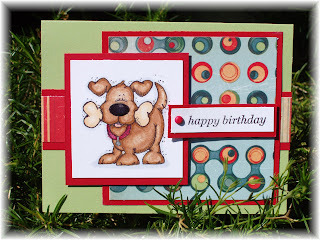 The Featured Stamper on SCS today is Susie (susiestampalot)...isn't that a cute name? Check out her gallery and blog. She's got some talent! I chose this card to case today for a few reasons. First of all, I love that Verve Anniversary Bird Susie used on her card. I don't have that one, but I have a similar one from a Hero Arts set called Decorative Birds. Secondly, I really liked the buttons she used on her card. And last, I loved the layout. 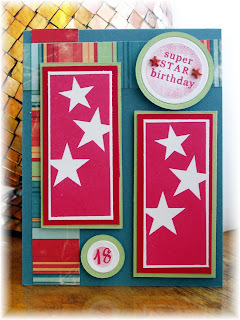 When you do a featured stamper challenge, you have to change at least two things on your card. 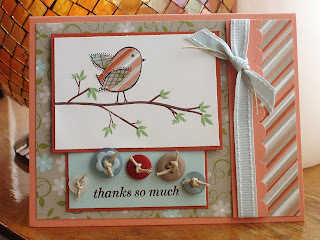 I changed the stamps, the paper, and I tweaked the layout by leaving off a layer under the bird and sentiment. It would have covered my dp too much, so I left it off. I paper pieced the bird using two dps. The blue flower button is new from SU. I also used the new SU scallop punch for the guava piece. So easy to use! The branch is PTI's Out on a Limb. This was the first time using this, and the overlay did not match up properly. I've read that there is an updated version of this set. Does anyone know about this? Was there something wrong with the overlays and did they replace it? I have to email PTI and find out. All the overlays were not lining up. I'm sending this to the family of one of my students who gave me a very nice gift card to Macy's. It's long overdue! Here is the inside of the card. The sentiment is from SU's Many Thanks and I think it's perfect for this. card. 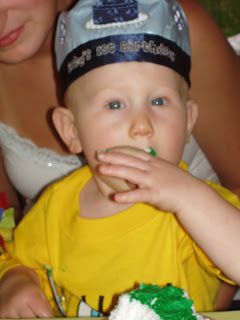 My great-nephew, Kristoff, is going to be a year old on Tuesday, and today was his very first birthday party. My niece had the party at a local park, Chestnut Ridge Park. He was such a good boy today...no crying, just laughing and playing with everyone. This is the card I made for him. I used Taylor's Cupcake Challenge #25. I saw this sketch yesterday and fell in love with it. When I was thinking about how I was going to do Kristoff's card, this sketch came to mind. It just looked very whimsical to me with the different shaped circles. I used this Cosmo Cricket paper, Links and Broadwith again...I think this is the third time, but they were all for boys and I really like this for boys! I'll have to get some other "boy" paper because I'm running out of these two! I used Blue Bayou for the base, then Real Red. I stamped the confetti stars and ribbon in Versamark on the red (click on the picture to see it better). It looked too bare. The circles were done in blue bayou, certainly celery, and pumkin pie and some were also covered in the dp. I didn't plan the "cupcake" theme to go along with the challenge (you don't have to use cupcakes in Taylor's challenges), but it was a nice tie in with the challenge. All the stamps used, with the exception of the candle on the cupcake, are PTI's It's a Celebration. The candle is from Piece of Cake. I used Blue Bayou, Certainly Celery, Real Red, and Summer Sun inks. This was a very simple card to put together, and I love the way it turned out. I also decorated the inside. Now what kind of "great aunt" would I be if I didn't brag about my niece and nephew? So here are some pictures from today's party. Kristoff and Andrea...isn't she pretty? 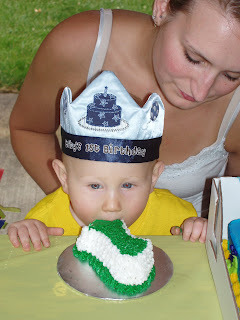 Kristoff is digging into his "smash" cake I made for him! 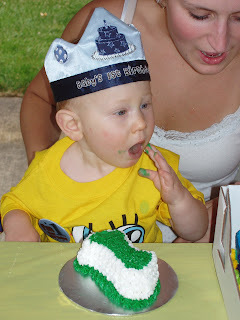 He found a better way to have his cake and eat it too! Thanks for letting me gush a little. I have no little ones of my own, so it's nice to be able to show off my family once in a while! Thanks for stopping by! As I was sitting there watching TV, I was pondering how I was going to do this color challenge and combine it with today's sketch challenge. I was watching an old episode of Two and a Half Men. It's the one with Denise Richards in it (the then Mrs. Charlie Sheen). They even had their actual daughter, Sam, in the episode as well. In the bedroom scene, I noticed the room was painted in an amethyst color and guess what the accents were? You got it...yellow and green! I couldn't believe it! The curtains were sort of a chintz pattern in a cream color with yellow and amethyst flowers with green leaves! So there you have it! My inspiration! And here is my card. I tried to find a flower that was soft and resembled a chintz pattern. I came up with a retired SU set called Simple Sketches. It's actually a 3-step stamp and I used the middle stamp for this. It was just soft and "sketchy" enough to give me the look I wanted. The base of the card looked bare, so I took the same stamp and used Versamark to give the background some life. I did the same to the wasabi strip. The yellow scallop piece was run through the cuttlebug using the Distressed Stripes folder. The main image is on dimensionals. The pearls on the wasabi stripe are from Hero Arts, and the larger one in the middle of the prima flower is from Martha Stewart's collection. I left off a sentiment...this could be used for pretty much any occasion. Thanks for stopping by! I noticed I have over 5,000 hits on my blog so far! Thanks so much for looking! 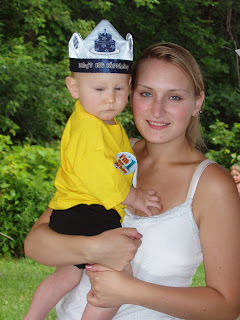 Today our nephew turned 18 years old! It's hard to believe, but he is 18...and a super star! He is a really nice, goofy kid and everyone loves Mark. I'm calling him a "super star" for a few reasons. First of all, he's an excellent athlete, especially on the track. He and his team have broken many a record and he is very passionate about this sport. Second he is well-liked by all, even his classmates. So much so that he and his girlfriend were nominated King and Queen at their prom. He had this silly crown that looked like the Burger King crown. He paraded that thing around at his graduation party and was disappointed to learn that he had to return the crown (goofy, I tell ya)! And third, he is going to Fredonia State College and is going to be on the track team there. He's just had a phenominal couple of years and we are very proud of him! So, I had stars in mind when deciding on what to make for his birthday card. This is what I came up with. I started with PTI's Text Boxed set. I stamped it in Real Red on white and mounted it on red then certainly celery. I took the colors from the Cosmo Cricket Broadwith patterned paper. The card base is Blue Bayou. The sentiment is from Limitless Labels (PTI) and the numbers from Ambassador Monogram (also PTI). I was wishing I had SU's star punch...now on my list! I used the circle Nestabilities (no scallops or ribbon for this "masculine" card). The star brads I just picked up the other day at Jo Ann's for a buck ( on their dollar rack). 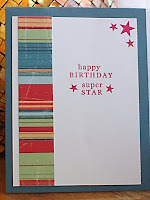 I also finished off the inside of the card with a strip of the dp, a few stars, and the sentiment. Mark and everyone liked this card and I hope you do as well. Thanks for stopping by! Hi all! My friend, Maria, just bought a bicycle for the first time in many years. She is the one who just had gastric-bypass surgery and is doing great...she has lost over 50 pounds so far! Yeah Maria! The bike she ended up buying is cotton candy pink and has a bell on it! Well, I cannot tell you how much ribbing she has gotten so far (she's only had it for a couple of days)! Her sons are having a ball with this one! I got a couple in as well, but I have to tell you I'm really proud of her! So much so, that I had to make a card in honor of this milestone in her life. With Maria's wicked humor, it couldn't be too sentimental, so this suits her well. Here is the card. I immediately thought of this bike from SU's Time for You. Maria's bike doesn't have a basket (that was the first thing I asked her about it), but she wants one! Crazy, I know! Anyway, I used copics to color it and used the silver Spica glitter pen on the chain, on the middle of the wheels where the spokes come together, and on the horn. I also used the lemon Spica glitter pen on the middle of the flowers. It was cut and embossed with Nestabilities. Now I knew I needed a witty sentiment...something like "ride on baby". 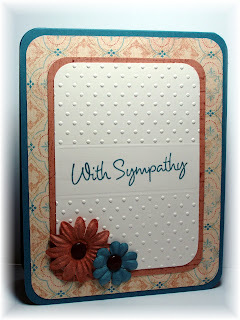 I was going through my stash of stamps and came across this MFT Twisted Sentiments set. (I looked for it on their website to link it, but couldn't find it. I don't know why.) When I saw this, I thought it would be perfect! I used Berry Bliss paper along with close to cocoa and pretty in pink. I love the addition of the flowers...I'm on a mission to use them more often. Now for the inside. I wrote my sentiment on there before I took the picture, so I had to crop it out (my handwriting is terrible and I didn't want you to see it!). Here is the inside with another Twisted Sentiment. I haven't had a stamp club class in a while. June was extremely busy for me with closing out the school year and all. The girls were disappointed that we weren't meeting, so I made sure to accommodate them with a July class. For this class, I'm using some sneak peek, current, and retiring (and some retired) stamps. A little bit of everything. I'm starting out with the sneak peek, Fresh Cuts. I've had this set for a while, but never got around to using it. 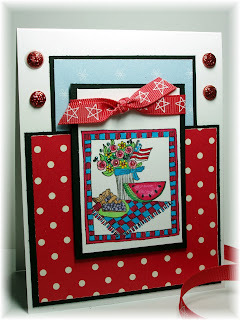 I had to go to the SCS gallery to see what everyone was doing with it, and of course Mary Fish's (Stampin' Pretty) card caught my eye and I cased it but changed it a bit. Here's my version. The colors come from Color Challenge 172, Taken with Teal, Wild Wasabi, and White, except I swapped out the Wasabi for celery. 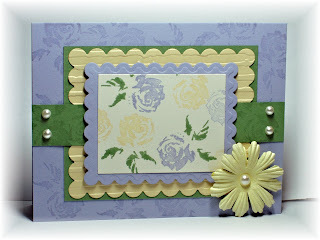 The base of the card is teal, and I used the stylized flower CB folder for the white background. The dp is Certainly Celery prints (which is why I swapped the Wasabi for the Celery). I did, however, stamp the image in Wasabi because it is a darker color. I used the blender pen and ink from the lid to color in the flowers, the flourish, and the moon/sun. I did quite a few layers to bring out the colors of the main image, and white grosgrain ribbon finished it off. set. The square was a little too large, but will work beautifully on another project, I'm sure! 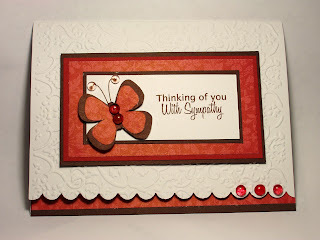 I used the Ginger Blossoms dp and Cameo Coral, River Rock, Groovy Guava, and Ruby red cardstock and ink. Each one was done a little differently, but they all coordinate. I did two landscape and two portrait just to mix it up a bit. I also placed the monogram in different places on the strip. I used decorative scissors to do the scallops on the cardstock (my SU scallop punch is in transit...I should have it next week), and used SU's scallop circle punch as well. The base is of the notecard is vanilla. 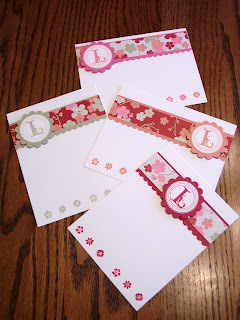 The three little flowers is the stamp from Live Your Dreams and it finished off and balanced out the card nicely. Now, I couldn't just let these beautiful notecards just float around without a home! They needed a folder in which to reside! So this is what I made. 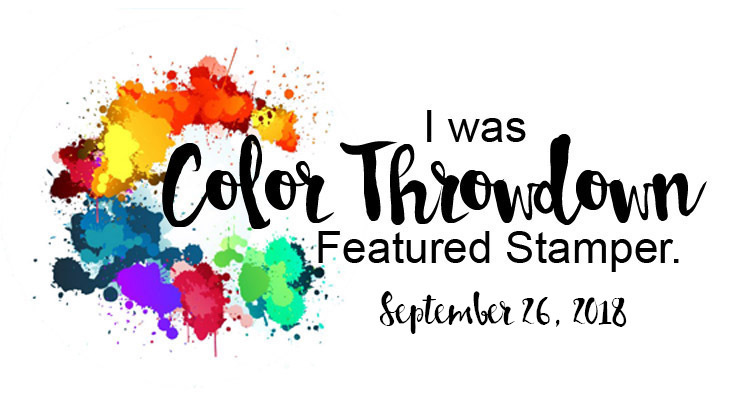 There's a new blog in cyber-town called Color Throwdown, and they are going to be issuing weekly color combinations. LeAnne Pugliese (Wee Inklings) is this week's host and I just had to play. I also have to give her this shout-out because she is always leaving nice comments on this blog...thanks LeAnne, and great color challenge this week! The colors she chose were Sage Shadow, Regal Rose, and Pretty in Pink. What great colors to work with! My next card is a sort of a case of one of my own I did recently (seen here) using PTI paper and sentiment stamp. Since I had to use SU for my class again, I used this color challenge and came up with this card. This card also showcases some retiring stamps. 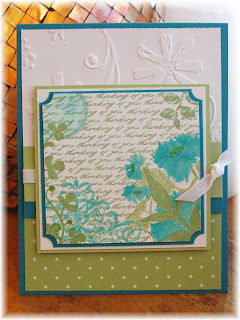 The Sage Shadow base was stamped in Versamark with retiring Print Patterns bg stamp. The main image is from retiring Blossoms Abound. It's a two-step stamp and requires using the Stamp-a-ma-jig. I stamped Pretty in Pink with the first stamp, then Regal Rose with the second layered over the first image. For the stem and leaves I needed two colors as well to get the dimension, however I didn't want to introduce another color. So, I stamped the stem and leaves (which is one stamp) in the Sage Shadow. The ligher color is also Sage Shadow...just stamped off once before I stamped it on the main image. Perfect for what I needed and no new color! The dp is from the Hostess Prints Pack (which is also retiring). I chose this dp because it also has a diamond pattern like the bg. 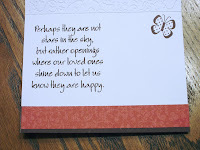 The sentiment is from retired Happy Harmony stamped in Regal Rose. The four white brads and pretty in pink satin ribbon finish it off. I did use my new Spica clear glitter pen I just received from MFT in the mail today. There are 13 colors in the set and the colors are really sparkily! The clear one is very subtle. I just colored over the flower and the leaves. You really can't see it unless it picks up some light, then it shimmers! Well that's it for this long post! I have to finish preparing for my class tomorrow! Thanks for stopping by! I'm "sew happy" that I cut up this set and about 20 others that I've had for a very long time. On Sunday, my DH and I took my mom to our cabin in the country. I took the Sunday paper, a new People magazine, and some of my new uncut and unmounted stamps. I did about four sets there while we were sitting on the porch watching my DH work! On Monday, I decided to do the rest of them. I did not realize that I had that many! I have blisters on my fingers (Ringo Starr says that at the end of one of the Beatles songs!) from cutting all of them! It literally took hours to do. Never again will I leave them uncut. I promised myself I would cut and mount them as soon as I get them. With SU's new stamps, it will be easy because they will already be die cut! Anyway, onto this card. One of the teachers on my 5th grade team retired this year. Carol will be greatly missed by all of us! She is very crafty, and one of her passions is sewing. She altered all the wedding dresses and bridesmaid dresses of our staff and their families, along with other miscellaneous alterations. I purchased this set, Happy Re-turns, from Gina K designs because of the sewing machine image! I started out with today's color challenge CC174 which was groovy guava, barely banana, and chocolate chip. It took a while to figure out which combination I was going to use and changed along the way. I stamped the image in black on the banana and colored it with my white Prismacolor pencil and accented parts with a silver pen. 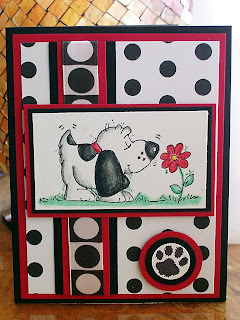 I got the idea for this card from this card by Julie Koerber. I couldn't find my container of old buttons (I found it after I finished the card, of course! 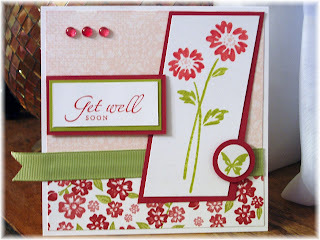 ), so I used prima flowers. I just happened to have the right colors, and I mentioned in a previous post that I wanted to use more of them, so it worked out. The centers of the flowers are something I picked up at Michael's called "Bangle Bling". They were with the jewelry making items and were on sale. They sort of looked like buttons to me. I attached them with a mini glue dot. I said before that this card changed along the way...I was originally going to use the opposite side of the dp (it has lines that look like stiches). But when I decided to use this diamond cuttlebug folder, I had to use the argyle side of the dp to match! The last thing I did was color in the spool of thread on the sewing machine with a blender pen and the ink from the lid. I colored outside the lines on one side. It seems I always do something at the end to mess something up! Oh well, please ignore that mess! I'm not 100% in love with this card. I was very restricted because of the colors, but I think it came out ok. It really does look better IRL (don't they all?). Well, thanks for stopping by and let me know what you think. Isn't this dog just the cutest thing? It just reminds me of my dog, Lizzie, because she's always got something in her mouth to play fetch with. In fact, just as I was taking this picture, my DH was bringing her back from the neighbor's house (we're going there for their son's birthday party) because she was trying to play bean bag with them! She was only there for about 3 minutes and got kicked out! Right now she is on her leash singing the blues (literally)! She is not a happy dog right now! On with the card...I made this for our now 11 year-old neighbor, Kevin, for his birthday. He loves Lizzie, so I thought this Whipper Snapper image was perfect. As I was going through my dp, I was concerned I wouldn't find anything appropriate (you know, being a girl I always go for the girlie dp). But this Cosmo Cricket paper worked. I believe the names of these two designs are Links and Broadwith. I colored the dog with copics (E33 and E37) and used the blender for shading. I used black for his nose and put some Crystal Effects on it to make it look wet. It's hard to see on the picture. I also used a silver pen to color in his tag. I used Julee Tilman's Mojo Monday #24 sketch (an oldie but a goodie) and because I had the sketch, it came together very easily and quickly! I hope you are enjoying your holiday weekend. Thanks for stopping by! Using the Scor-Pal, that is! Today's Ways to Use It Challenge is to use scoring in your card. Well, I knew immediately that I needed to pull out SU's Blossoms Abound. Can you believe I never inked, much less cut it up and mounted it? I bought it just for this type of technique...scoring and clear embossing. I've always thought this stamp should be on tiles, so that's what I made it look like (I hope!). 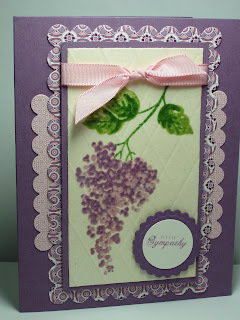 This is a two-step stamp set, so I first stamped it in PTI's Lavender Moon (the lighter color) on Vintage Cream cardstock, then used the next stamp in Plum Pudding (the darker shade) and, using the stamp-a-ma-jig, overstamped it to get the shading. The stem and leaves are also two-step stamping. I stamped the branch in Wild Wasabi and stamped the leaves in Certainly Celery using the SAMJ again to line it up. Then I took the piece to my Scor-Pal and scored it on the diagonal every 1/2". I inked it up with Versamark and clear embossed the entire piece. Very easy! I had trouble, however, matting it. I was inspired by this card I saw on SCS yesterday. Let me tell you that it took a long time to come up with this layout (sketch challenged...I told you!). I didn't have the long rectangular nestabilities (now on my list), so I had to cut one and a half scalloped rectangles and tape them together. Because of the busy pattern, you can't tell and I was happy! The rest came together easy...an SU pink taffeta bow, PTI sentiment using circle and scallop circle nesties. The main image and the sentiment are on dimensionals. This is going to a friend who recently lost a loved one. I've been delinquent on sending a card. Well, thanks for stopping by! Sketch Challenge 4th of July! I did this card for the Sketch Challenge on SCS today. I know I say this all the time, but these are my favorite challenges. I'm usually sketch-challenged when I sit down to do my cards. So these really help. Today's sketch was perfect for what I wanted to do with this Karen Lockhart image I just got last week at my LSS, Buffalo Stamps & Stuff. I left a little white cardstock above the image to accommodate the sketch and used it to tie this fabulous star ribbon onto. I purchased it at AC Moore (it was on a roll of 4 ft. for $1). It worked so nicely. I first colored the image with copic markers (there are about 15 different colors going on in this one little image)! Then I went looking for red and blue dp to match. I came up with SU's Cutie Pie and retired Cerise. I can't wait for SU's new catalog to come out to see what new dp they have. I just love their papers lately! I mounted everything on black cardstock to give it some pop. There was some white space that needed something. I had also purchased these glitter dots at my LSS along with the stamp, and they worked perfectly to fill in the white space. These glitter dots can also be purchased at Gina K designs. I had purchased some other colors from Gina K and was happy to see that my LSS carried them too! I took the picture and then put the card in a envelope and sent it off to my Aunt Vi. She's well into her eighties, and loves to send and receive cards. I've made some for her in the past and she loved them. I have make more for her. I think she'll like this as well! Thanks for stopping by! My husband told me the other day he needed a sympathy card to give to someone at work. He had to remind me again about an hour ago (it's about 11:15 p.m. right now!). Again, I'm rushing to get something done instead of having some on hand. 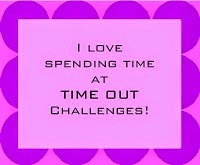 I really need to get going on these all occasions cards! I just picked up this K & Company mat pack at AC Moore yesterday. I flipped through it and saw this wonderful dp that matched Blue Bayou perfectly. So that's where I started. I knew I wanted something simple and had seen this done with the cuttlebug and Scor-pal. I used PTI's new Vintage Cream cardstock and matted it on creamy caramel after I stamped it with Sanded background stamp in close to cocoa. It's hard to see the Sanded, but it's there and looks better IRL than just the plain background. I've also decided that I want to use more Prima flowers on my cards. 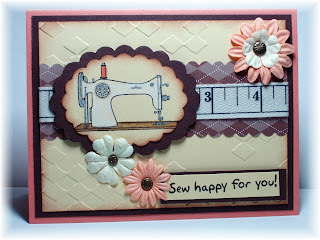 I've been looking at the cards that Cindy Haefner has been creating on her new blog and decided that I like them. So here they are! I used these larger brown brads from American Crafts. The sentiment is stamped in blue bayou. I also rounded the edges of the card and layers. I like that look! I hope DH likes it....he's sleeping now and won't see it until tomorrow morning! Thanks for stopping by and please scroll down to see the 4th of July post I did earlier today!